Category: Point of Sale Design, Sales Promotion Design & Pull-Up Banner Design – Co. Mayo, Ireland. Client: O’Haras of Foxford, Foxford, Co. Mayo. Designwest have been working with O’Hara’s of Foxford for nearly a year now and we have really enjoyed getting back to our roots and doing some POS (point of sale) designs for consumers. This featured point of sale Design piece is basically an exhibition display podium for use at tasting events in-store or at exhibitions etc. The design in question was really simple and uses some of the amazing photography that the client has of their products including also some imagery our design team sourced from Stock imagery. The end result is a really attractive tasting unit. Category: Roll-up Banner Design and Branding Concept Design, Castlebar, Co. Mayo. 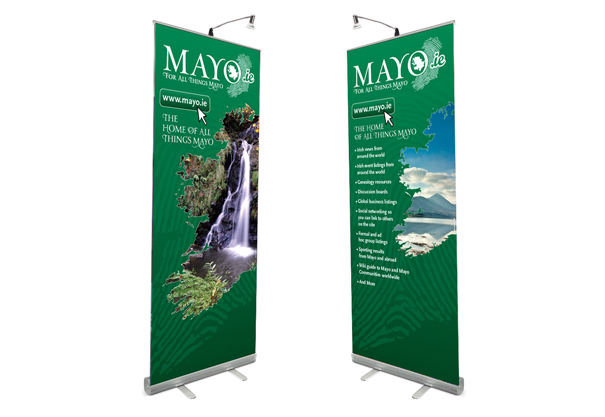 The pull up banners designed for the Mayo.ie project used beautiful photography taken by some of Mayo’s best known landscape photographers in it’s design. The overall designs needed to have a very unique Mayo and Irish feel to them. The Mayo.ie logo and concept design idea features very strongly on the banner designs and we think the end result is some very striking banner designs. Category: Promotional Literature Design, Pull-Up Banner Design, Booklet Design, Signage Design Galway, Ireland. Client: PR Works – SCCUL Entrepreneur of the Year Awards. In collaboration with Galway based public relations firm PRWORKS, Designwest created all of the promotional materials for SCCUL Enterprises annual SCCUL Entrepreneur of the Year Awards. The awards were based upon five categories, retail, industry, service, technology and social entrepreneur, with an overall winner chosen along with the winner from each category. Designwest created the initial identity design for the awards and all brand design collateral, including the introductory brochure design, application forms, press advertisements design, invitations to the awards, as well as certificates for the finalists and award winners. The range of applicants, finalists and winners prove that the West of Ireland has a vibrant and successful small business community of hardworking entrepreneurs! Project: Identity Design and External Banner Design, Kiltimagh, Co. Mayo. 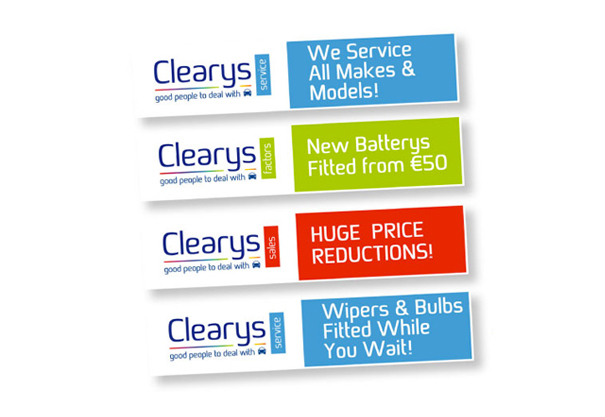 Clearys of Kiltimagh are an established car dealership and motor factor serving customers throughout Mayo and the West of Ireland. Designwest created their initial logo design and branding design system, which uses a vivid colour palette to define their three main divisions, sales, service and factors, used in various marketing materials including these large format banners which are very visible when passing the dealership on the main street of Kiltimagh. Designwest also created colourful, eye catching vehicle graphic designers which advertise Clearys wherever their vans travel around the countryside.